August 2015. The Copa del Rey Panerai, organised by the Club Marítimo de Mahón and the Real Club Náutico de Barcelona, closed its 12th edition today most spectacularly, with a final regatta in which the Gregale (NE wind) proved to be more generous than on the two previous days. The fleet completed a final run of 17.5 nautical miles along the north coast of Menorca, which brought this year’s competition to a fabulous close, in which half a hundred vessels from 12 countries competed. This year once again plainly confirmed the importance of an event that classic and vintage ship owners consider ‘essential’. On Saturday night, a Price-giving ceremony was celebrated in the terrace of Club Marítimo de Mahón were winners of each class not only received an engraved silver platted trophy but also an exclusive Panerai watch. Not only did the Copa del Rey Panerai offered unique racing moments and the chance to admire the fleet, the regatta also offereded an entertaining social programme for the competing crews from Wednesday to Saturday. The Panerai Lounge, based at the terrace of Club Marítimo Mahón, provided healthy breakfasts in the morning and a drinks reception every evening to celebrate the journey. The last stage of the Mediterranean circuit for the Panerai Classic Yachts Challenge will take place in France, with the Régates Royales de Cannes, from 22 th to 26th September. Moonbeam IV (1914) won the three regattas that were held between Thursday and Saturday proving that a crew primarily made up of amateurs and volunteers can outperform all other contestants if it is well managed. The big boat skippered by Mikael Creach, one of William Fife III’s most famous designs, found no rivals in the Bermudan cutter Halloween (1926), which finished with four points less, or in Moonbeam III (1903), which was always sailing alongside the stern of its brother (younger, but longer). The winning team, captained by Breton sailor Mikael Creach and representing the Real Club Náutico de Palma, celebrated its second victory at the Copa del Rey Panerai (in 2011) at the Levante pier in Mahón to the lovely music from its own bag-piper. There was no clear favourite in the Marconi Rig Vintage category and the Rowdy (1916), designed by Nathaneal G. Herreshoff, ensured its better constancy was valuable to gain a victory while debuting its new crew at the Copa del Rey Panerai. The British Classic Yacht Club (BCYC) sailboat obtained a first, a second and a third (in this order). At the end of the competition, this translated into a two-point advantage over Leonore (1925), the Q-class owned by Johan Anker, which paid dearly for an error (fifth) in the last leg. Philip Jordan’s Manitou (1937), renowned for being US President John F. Kennedy’s recreational yacht, was successful in the regatta of the day and ascended to the podium, beating Enterprise (1939), owned by Albert Kusak. The sloop Argos (1964), with Eduardo Pérez at the helm, was the fastest yacht in the Classic category (1950 to 1975), especially with the mild breezes from the east blowing on the first two days, obtaining its second victory at the Copa del Rey Panerai, with the first obtained in 2012. It won the first two regattas and came in second in the third race, in which Damián Ribas’s Alba (1956) made good use of the fresh Gregale (NE wind) to obtain a partial victory, which gave it an overall fourth place ranking. 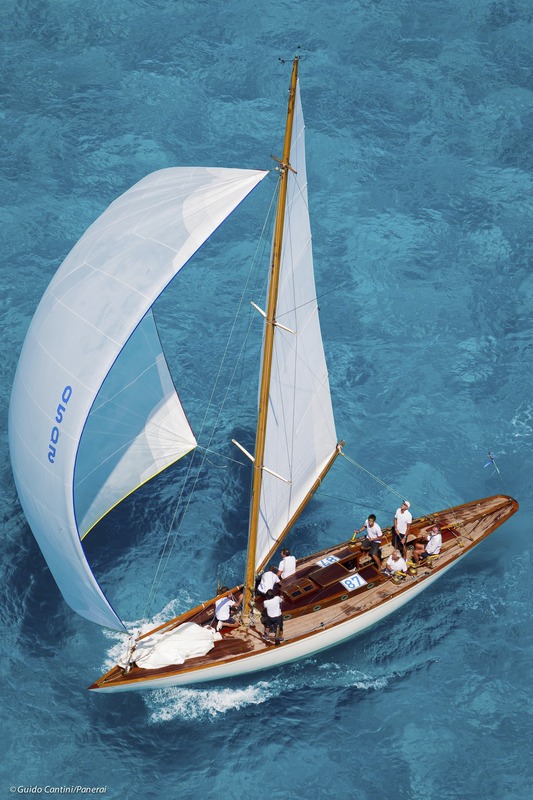 The disqualification of Yanira (1954), due to a protest from the Corsaro II (1960), the Bermudan yawl of the Italian Military Navy commanded by Simone Giusti, let the latter win second place. The chance circumstance of the jury’s decision took Encounter up to third place. El Savannah, the smaller replica of a J class constructed in 1997, closed its first participation in the Copa del Rey Panerai with a partial victory, which let it secure an overall second place in the Spirit of Tradition class, coming in behind Javier Pujol’s unrivalled Calima (1970), making a milestone in Spanish sailing when it won its 10th victory at the Mahón regatta. Javier Pujol’s Sparkman & Stephens, Fastnet winner in 2001 and sailing under the pennant of the Club Marítimo de Mahón, is by far the most awarded boat in the history of the Copa del Rey Panerai and one of the undisputed Mediterranean leaders in its category. Founded in Florence in 1860 as a workshop and watch-making school, for many decades Officine Panerai supplied the Italian Navy and, in particular, its specialist diving corps, with precision instruments. The designs developed by Panerai in that period, including the Luminor and Radiomir models, were covered by the Military Secrets Act for many years and were launched on the international market only after the brand was acquired by the Richemont Group in 1997. At present, Officine Panerai develops and crafts its movements and watches in the Neuchâtel manufacture. The latter are a seamless blending of Italian design flair and history with Swiss horological expertise. Panerai watches are sold across the world through an exclusive network of distributors and Panerai boutiques. In honour of its historic connection to the sea, Officine Panerai has been promoting classic sailing culture for many years, by sponsoring the Panerai Classic Yachts Challenge Trophy, the main international circuit for vintage boats. In 2007, the firm acquired and restored the Bermudan ketch Eilean. Constructed in 1936 at the legendary Scottish shipyard Fife of Fairlie, it is presently the brand ambassador in circuits and regattas for classic and vintage boats.